Harry James Kiff, born ? The photograph on this issue's cover is of Abbot's Langley Parish Church, Hertfordshire, sent in by Peter Kiff. This church will have been well-known to many of the Kiffs on the Hertfordshire tree. And now apologies for being out of touch for a while. A wonderful and interesting fortnight's holiday was followed by an equally interesting illness, which although not serious, did leave me unable to deal with everything I usually do. Finally feeling fully recovered, I have waded through all the fascinating information you have kindly sent in since the last newsletter, the results of which follow. 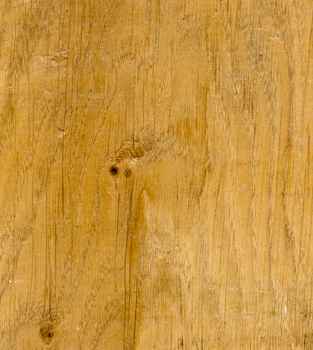 We have a number of updates to our Kiff and Kift trees, as well a new branch to try and fit on to the Devon tree. With all the new and corrected information, I hope to get updated trees out in time for the next Kiff Day. So please continue to send in your updates and corrections. And now my usual begging section - the newsletter cupboard is once again looking very bare. So any articles, snippets of information or interesting facts will be gratefully received. This is the title of the first special publication of the Hertfordshire Family and Population History Society and it is an alphabetical listing of criminals prosecuted in Hertfordshire who received transportation sentences to Australia between 1784 and 1866. When Lori-Ann Foley ordered a copy, she noticed that amongst the many hundreds of people who found themselves sentenced to transportation were two Kiffs, a Robert and a Thomas. Robert Kiff, of St Peters, St Albans, was 27 when he went on trial in 1842, appearing before the Liberty of St Albans Easter Sessions. He was charged with "breaking and entering a dwelling house", where he made off with "a hen fowl 1/0d property of John Sibley". Thomas Kiff, of St Albans, aged 33, appeared at the same sessions as Robert, when he was charged with "stealing from the person". His haul was made up of "3 halfcrowns, a shilling and a sixpence, property of David Smith". Both men received a sentence of 10 years and on 5th October 1842 were on the ship Earl Grey when it departed for Australia. The captain of the ship was Alexander S Mollison, the surgeon was Colin A Browning. The ship arrived in Van Diemen's Land on 14th January 1843. 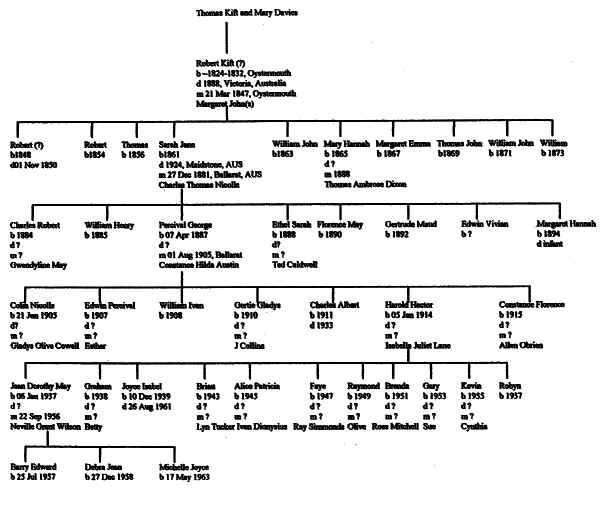 A look at the Kiff family tree for a Robert born circa 1815 and a Thomas born circa 1809 reveals two sons of James Kiff and Catherine Russell. Robert was christened on 11th December 1814 at St Michaels. He appears on the 1841 census, living at Fishpool Street with his mother and 3 of his brothers. Robert hadn't appeared on any further censuses, so it seems we now know where he went. Thomas was christened on 21st January 1808 in St Michaels. The 1841 census shows him living with his wife, Susannah/Susan Cockle, his two children James and Mary, and his future sister-in-law, Ann Penny in Fishpool Street, next door to Robert. The 1851 census reveals that Susan, still in Fishpool Street and working as a straw plaiter, is married with three children. But no husband is listed. This fits in if the Thomas who was transported to Australia is the Thomas who married Susan. The only anomaly is the third child, Eliza, who was born in 1847, and another child attributed to this family, Ann, bc 1854. It seems that if Thomas did go to Australia, Susan, not surprisingly, found someone else to support herself and her children. The GRO records show a Susan getting married in 1861 in St Albans - perhaps Susan is remarrying? Ordering the marriage certificate would confirm this for Lori-Ann. Lori-Ann hopes to get additional information on the records that can be found in Australia and in the meantime would be grateful to hear from anyone with ideas to confirm or correct the above. Laurie Page has sent in an update to the descendants of James Kiff, born 1787, and Elizabeth (see below). This family can be found on page 24 of the family tree. And in a case of serendipity, another descendent of this branch has come forward - Alan Michael Kiff and his wife, Patricia Ann. Alan's grandfather, James Kiff, b 1864 (son of Daniel Kiff and Eleanor Gilby) was a Royal Mail coachman, married to Elizabeth Wise. James died in 1913, when Alan's father, Rowland John, was only 4. So Rowland knew very little about the family. At 5'3", Alan is a Kiff in true tradition. A probable tree is below and any additions or corrections would be welcome. 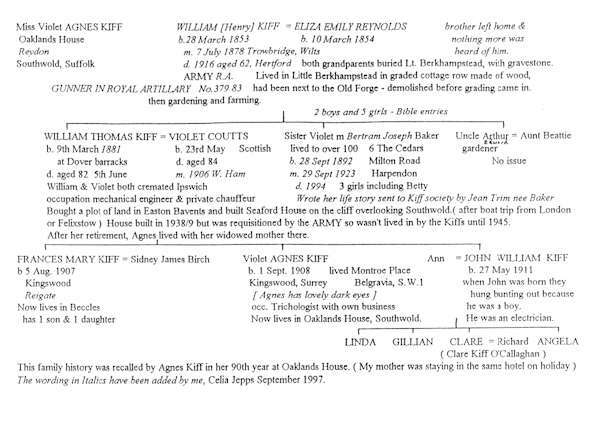 This family history was recalled by Agnes Kiff in her 90th year at Oaklands House (My mother was staying in the same hotel on holiday). The wording in Italics have been added by me, Cefia Jepps September 1997. A new line for the Devon family features below, the information supplied by descendant Trish Walker. Any ideas on how or if they relate to our current Devon tree would be, gratefully received. It was William Daniel Kiff, who with his sister, Mabel Eleanor Kiff (May)'s husband, Ivan Franklin, helped to make the coffin for the unknown warrior at Westminster Abbey. The GRO records show William Daniel, born 4th 1893 in Hendon. William went on to marry Miss Blagden in 3rd(Quarter) 1924, Hendon. They had three sons, Kenneth P in 2nd 1925, Hendon; William J W in Ist 1933, Hendon; quicidy followed by Horace J in 4th 1934, Hendon. To follow the boy's fortunes a step further, the records show that Kenneth married Miss Langston in Harrow in 4th 1949. Alan and Pat Kiff, who's branch features above, think that William could have been the brother of a Rowland Kiff, possibly the Rowland on their tree. But further confirmation of that is needed. The records also show a Mabel Eleanour Kiff who was born in 2nd 1896 in Hendon, but I cannot see any marriage to an Ivan Franklin. Any help would be gratefully appreciated, as would a reminder of the well-known firm of coffin-makers they worked for. There were no Kifts listed on the 1841, 1851, 1871 and 1881 census records for Aberystwyth. Celia wonders if 'nursechild' could be an old tern for 'foster child'? John and William are probably the children of Richard and Rebecea, as Rebeeca died in 1868 in Barnet. And finally Celia has sent in a sketch of these two headstones from St Andrew's Church, Little Berkhampstead. 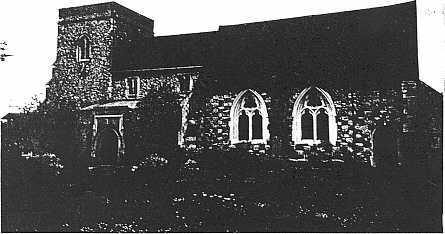 Ray Warden, of Devon, is researching the Ransley family and came across Rosina Priscilla Ransley, who married Harry Wallace Kiff on 23 July, 1911 at All Saints, Prittlewell, Essex. Harry's father was Harry James Kiff, an agent. Harry, jnr, and Rosina lived at 9, Albion St, Milton Road, Southend. They had two sons, Wallace H (Walter) Kiff, born 1912 in West Ham, and Ernest F H Kiff, born 1914 in Romford. Both boys had distinguished naval careers in World War 11 and it is thought they were decorated. Harry was an able seaman and died during the First World War on 14 September, 1916, aged 30. He was buried in Gillingham military section, New Cemetery, row 24, no 1255, Naval section. Rosina remarried in 1935, to Harry Bollinbroke. A look at the GRO records show a Wallace H Kiff marrying a Miss Budden in East Ham in 1939. There are two possible references for Ernest:- Ernest F R Kiff marrying Miss Sanctuary in East Ham in 1937 and Ernest F Kiff marrying Miss Carrick in Ilford in 1947. The birth indexes which run up to 1950 don't show any offspring under any of these maiden names. Mr Warden would very much like to know what happened to Ernest and Wallace(Walter). Any information would be gratefully received. If we turn briefly to the top of the tree, our records don't appear to show a Harry James Kiff, but there is James Henry Kiff, born 1848 in St Lukes, who was married to Mary Maria Harding. The 1881 census for Tottenham shows the couple with three children:- William Alfred Henry, b 1876; Annie Grace L, bc 1878, Ella Elizabeth L (Nelly), bc 1880. 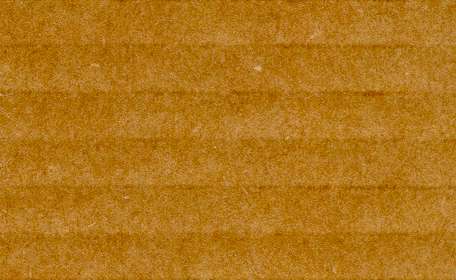 James Henry is shown as a clerk in a carpet manufacturers. It is also thought that there may have been a fourth child for the couple..- John Ernest H Kiff, born 1883. If the 1891 census for this family is eventually found it would confirm if Harry Wallace Kiff was a part of this family or not. Further details would he welcome. following information. If they relate to your branch and you'd like fuller dews, or copies, please let Lori-Ann Foley know.